For the second straight season, the Cleveland Indians have hit the All-Star break sitting in first place in the AL Central. Likewise, for the second straight year, they’ve gotten this far despite receiving woeful contributions from the exact same position. It should be noted that, compared to last year, the Tribe’s first half of the season has been slightly underwhelming. It’s also worth noting this isn’t all entirely thanks to one position. 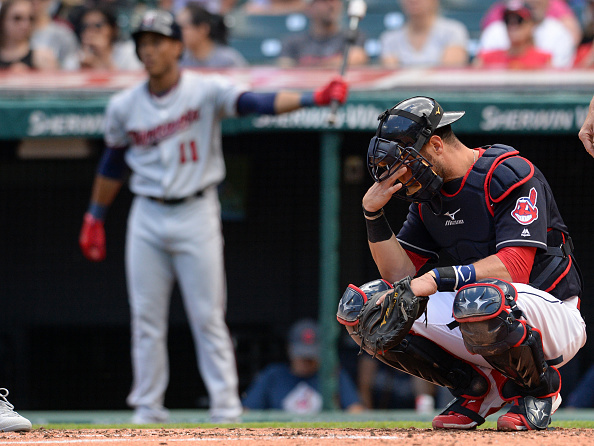 Key players like Carlos Santana and Jason Kipnis have gone through slumps. Outside of Corey Kluber, the performance from the starting rotation has been uneven. However, only at the position of catcher are the Indians dealing with a bad case of déjà vu. Once again, Yan Gomes is in the middle of a miserable season at the plate, while his backup – Roberto Perez – isn’t able to provide much relief. As a result, Cleveland is spending yet another summer trying to find a solution at catcher. The culprits from this year are the same who were under-performing last season. Gomes had a 2016 to forget, littered with poor at-bats and ill-timed injuries. He finished the year with a .167 batting average, by far the worst of his career. While Perez was able to contribute at times during the postseason, he, too, didn’t put forth a season to write home about. His average was only a few points higher than Gomes’, while his on-base percentage saw a significant year-over-year drop-off. Things haven’t gotten much better this time around. Gomes opened the year looking as though his funk from 2016 was still alive and well. His confidence appeared to be in the dumps, and his strikeout rate has been on the rise. He’s currently only 14 K’s away from topping his 2016 season total, and in only 62 fewer at-bats. In Gomes’ defense, it did appear as though he was finally navigating his way out of this skid. A solid month of May resulted in his batting average jumping from .200 to .267, leading many to believe we were seeing the return of the 2014 Silver Slugger winner. Alas, his average has since tumbled back down to .222, and his at-bats once again look like an exercise in futility. Just as we saw last year, Perez has been unable to provide anything better at the plate. As with Gomes, he’s on pace to surpass his 2016 strikeout totals in the very near future. Likewise, his .178 batting average isn’t giving Cleveland much in terms to finding an alternative to Gomes’ struggles. These two are combining to make it near-impossible for the Indians to avoid a black hole on their batting order. It’s gotten so bad some fans have even been suggesting the Tribe pinch-hit Josh Tomlin whenever Gomes comes up at a crucial time in a game. As a reminder, Tomlin is one of Cleveland’s starting pitchers. On a bright note, it’s not all negative when it comes to Gomes and Perez. While each is struggling at the plate, they both continue to excel behind it. Each player has yet to show any decline in their ability to gun down runners. Gomes specifically is boasting a caught stealing percentage of .463, easily the highest of his career. Unfortunately, what these two are giving defensively isn’t enough to overshadow the lackluster offense. Further complicating matters is the fact Cleveland has made recent commitments to both Gomes and Perez. The former is under contract through 2019, while the latter just received an extension this past offseason. This would imply the team may be hesitant when it comes to booting one of them out of the lineup. It’s safe to say the situation was a little easier around this time last year when Gomes was injured and Perez was on a short contract. How the team goes about finding a solution at catcher now will be one of the big storylines as the trade deadline nears. Both Gomes and Perez have shown flashes during their time in Cleveland, with Gomes specifically becoming one of the Indians’ core players back in 2014. However, each is currently a major offensive liability. It all results in an incredibly difficult position for the Indians to be in. Cleveland may be committed to both catchers. However, if neither can start making significant contributions at the plate, the team will be forced to find someone who can.